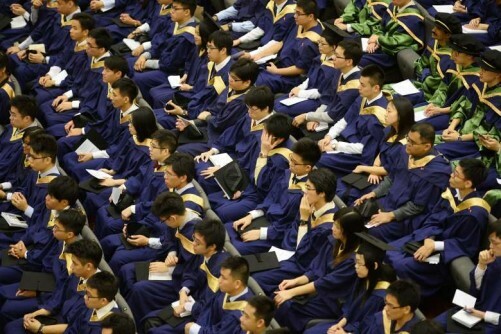 SINGAPORE - About 180 graduates from the National University of Singapore (NUS) School of Computing received their degrees at the main ceremony of the NUS Commencement 2016 this morning (July 7). A total of 10,395 students graduated this year, including 6,491 receiving bachelor degrees and 3,904 receiving graduate degrees. They include graduates from the pioneer batch of two new degree programmes: five from the two-year, full-time Master of Music programme at the NUS Yong Siew Toh Conservatory of Music, and three from the Master of Science (Nursing) research programme offered by the Alice Lee Centre for Nursing Studies at the NUS Yong Loo Lin School of Medicine. A total of 23 ceremonies will be held at the University Cultural Centre from today until next Thursday (July 14). "The pace of change will continue to accelerate because of the convergence of technology, as well as globalisation and near-instantaneous communication," said Professor Tan Chorh Chuan, president of NUS. "Yours is, perhaps, the most rapidly changing of fields, where knowledge and skills can become obsolete very quickly," he said, addressing the computing graduates at the main ceremony. "Hence, lifelong learning and re-skilling is a must-have and not just a good-to-have for your future success." The valedictorian from the School of Computing was Ms Yap Zi Xuan. "When I first matriculated, I had the intention of joining a financial or consulting firm upon graduation as the pay tends to be lucrative in these companies," said Ms Yap, 23. "That held true until our first summer vacation, when the Orbital Programme was introduced for freshmen." The Orbital Programme requires students to initiate their own projects and work independently. Ms Yap said it fuelled her interest in user experience design and web development. "As I made a drastic change in my career choices from then on, I became thankful for the abundance of career opportunities offered by a computing degree," she added. NUS also conferred the Honorary Doctor of Laws degree on Speaker of Parliament Halimah Yacob. In her speech, Madam Halimah emphasised the importance of not being defined by one's circumstances. She recalled the advice of a well-meaning teacher in her secondary school, who had urged her to take up a stenography course, and learn typing and shorthand. "I was thinking to myself at that time, why should girls only be typists, stenographers and secretaries? Why can't we have other dreams and hopes?" she said. "I decided then that being a female is not going to define me in what I do with my life." What does AI mean for your data centre today?